Hey everyone! It's been a hot minute since I jumped on here and said hello. Isn't this season the busiest but also the best?! I sure think so! We've been busy making lots of memory, eating lots of treats and spending a lot of time with people we love and adore. Boom! Win! However, hey, I freaking miss you all! So I'm just stopping on by to share a list of a few of our favourite things these days. With the chilly weather we are loving all the cozy clothes we can find! 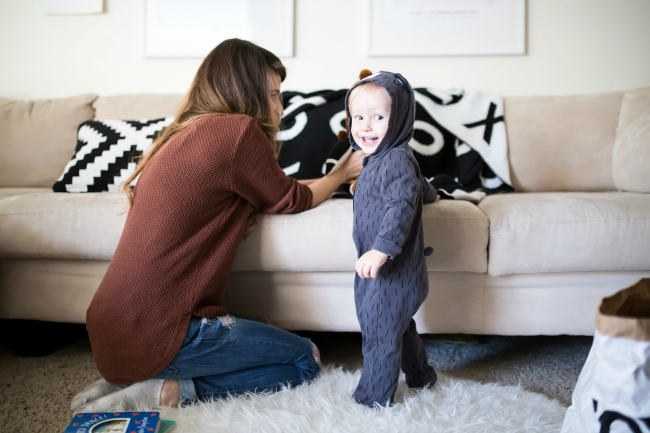 This bear suit on Hudson cracks me up every time we put it on him and its perfect for layering for a onesie or even pants and a long sleeve shirt. It is just the darn cutest thing I have seen! For myself I am loving all of my cozy and chunky knit sweaters! This rust colour is at the top of my list for sure too. I love that this time of year is all about cozy and comfy clothing because lets face it...I am eating all of the treats this season! mmmm! If you want to make shopping online easy and fun ( it's always fun!) you need to check out Octer.com... this website combines a lot of my favourite stores which means all of my options are right there in one website! SO easy! We have also been keeping extra cozy in our thick knit blanket for Modern Burlap. When Hudson was teeny tiny we loaded up on the muslin wraps from them and loved those so much. They are still in great condition even after so much use. Now that we have this monochrome XO blanket we use it daily and it is our go to blanket when we need one on an outdoor adventure. We want to be toasty even when we make the chilly venture out the door. Hudson fell in love with his little penguin friend Everest the moment they laid eyes on each other. Seriously though, it was such a sweet moment. Everest now usually accompanies us everywhere and is H's best little buddy. What is even better about this arctic friend is that where he comes from with every doll sold Cuddle and Kind donates TEN meals to children in need. That is so so amazing and I love companies that give back! Plus they have some of the sweetest dolls I have ever seen. 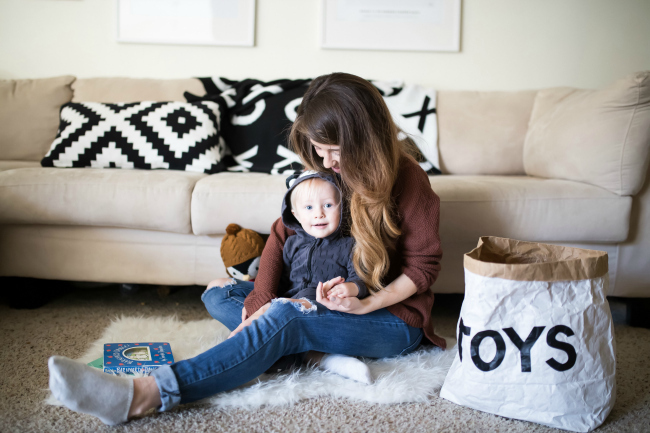 Do you struggle with storage for your kids oh so many darn books, trinkets, blocks, and just toys in general? I am always on the hunt for storage that also isn't an eye sore in our home. This toy bag is perfect and goes along great with our decor. 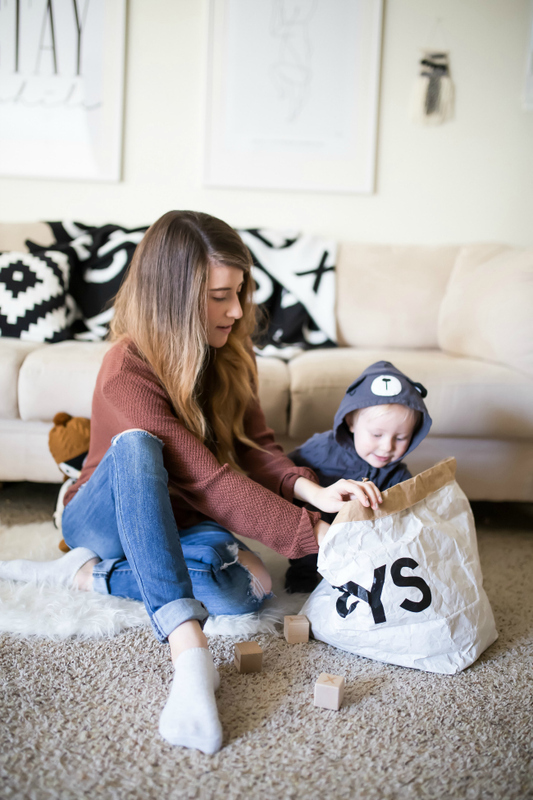 TellKiddo has so many more options for storage bags that I want them all! Wooden toys have always been a favourite of ours around here and Little Saplings has always been our go to. 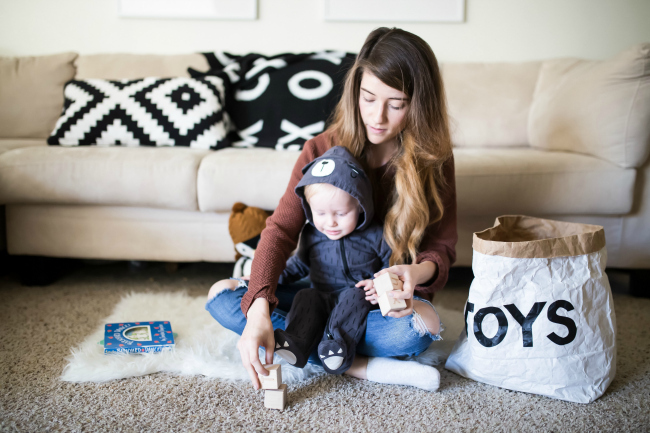 I always shop their wooden toys for kids birthday presents, teethers for H AND I may have gotten one too many things for H for Christmas from them too! Ah! So exciting! Well, here you have my little list of a few of our favourite things right this moment! With the holidays around the corner it's not to late to add these to your wish lists!